There have been some changes in Ottawa since our first version of the Roadmap in October 2012. Please visit the Ottawa Autism Roadmap page to see the latest one. Please send us your comments, questions and feedback. This year the Gloucester Fair is changing it’s dates to mid-August and our name. 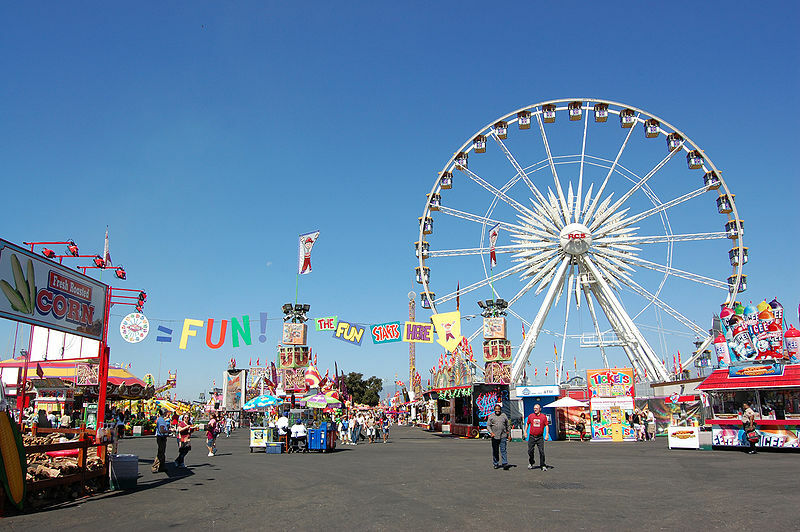 Join us on Monday when we announce our “Rename the Fair” contest on the CTV2 Morning Show. Everyone is welcome to enter the contest and win the great $1,500+ prize package for suggesting the best name. 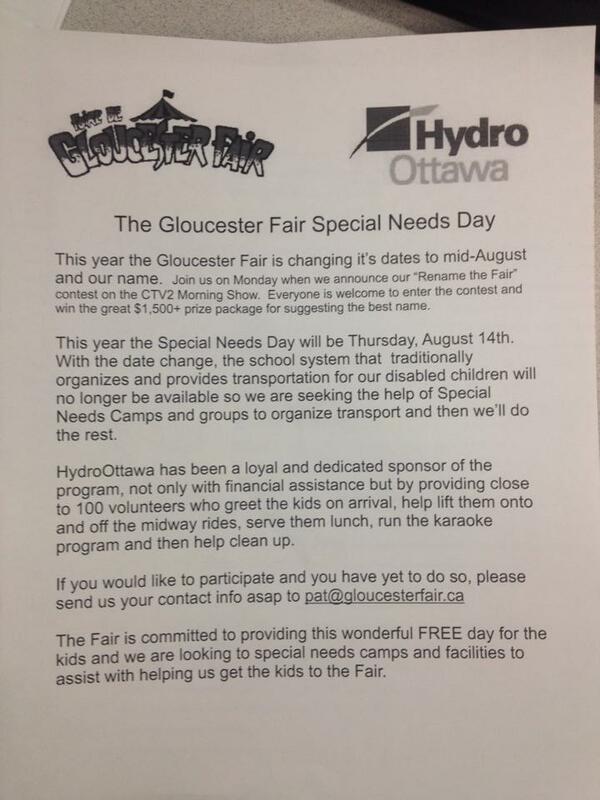 This year the Special Needs Day will be Thursday, August 14th. With the date change, the school system that traditionally organizes and provides transportation for our disabled children will no longer be available so we are seeking the help of Special Needs Camps and groups to organize transport and then we’ll do the rest. HydroOttawa has been a loyal and dedicated sponsor of the program, not only with financial assistance but by providing close to 100 volunteers who greet the kids on arrival, help life them onto and off the midway rides, serve them lunch, run the karaoke program and then help clean up. The Fair is committed to providing this wonderful FREE day for the kids and we are looking to special needs camps and facilities to assist with helping us get the kids to the Fair. Hi everyone! On Saturday, March 22, 2014 I went to the City of Ottawa Special Needs Camp Fair. I gathered a lot of information and I am now going to share it with all of you that were not able to make it! Here is the first camp I will be sharing with our friends! Except for Harmonized Sales Tax (HST – 13%) our fees are all inclusive. They include food, lodging, all activities, excursions off site, transportation and laundry. There are no extra charges. However, guests not covered by a Canadian medicare plan may be billed if outside medical, dental or pharmaceutical services are required. Info: Counselors at Inspirations have a superior knowledge and ability in working with children, adolescents and adults on the Autism Spectrum as well as other developmental disabilities. Staff are compassionate and are well trained in order to manage a variety of behavioral situations with common and innovative techniques. Staff have extensive experience supporting vulnerable persons and their medical needs such as; aspirations, g-tube feeding, range of motion, catheters, seizures and many other areas. Inspirations Camps believe in inclusive communities and environments. Outings and Activities include; museum trips, adaptive sailing, paddle boating, daily physical activities, water parks, zoos, animal farms, bowling, sports, Saunders Farms, Daceability, natur walks, Omega park, movie theatres, fairs, musical festivals and radical science. Info: We at Sonshine Cove believe that each child or young person should be given the opportunity to participate in as many different experiences as possible. Our programs are tailored for the specific age and ability level of each camper. In addition to our traditional summer camp programs, we also offer summer camp for children and adults with special needs. Everest: An individualized program for campers aged 8 to 13. With a focus on social skills and confidence building. 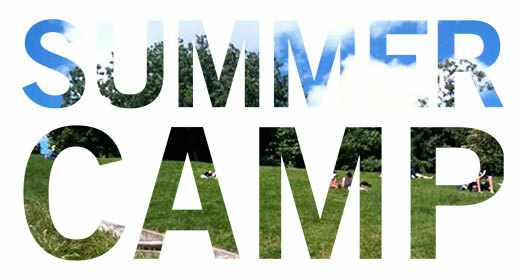 Summit: An individualized program for campers aged 13 and over. This program focuses on life skills and social skills to prepare the individual for future jobs and independence. Ongoing throughout the camp season starting on a Sunday and ending on a Saturday. Info: Camp Kirk is a registered charitable organization operating a camp for children with Learning Disabilities, Attention Deficit Disorders, some Autism Spectrum Disorders and other additional needs. Camp Kirk’s mission is to provide an experience that builds a sense of belonging and self-esteem for children with Learnin Disabilities, Attention Deficit Disorders, Autism Spectrum Disorders and those with Incontinence/enuresis difficulties. ■To serve children who have learning disabilities. ■To provide a safe physical, social and emotional recreational environment adhering to high standards of general camping practices. ■To design and provide a camp programme that will allow children to increase their understanding of themselves and of their learning disabilities. ■To design and provide a camp programme that will teach them the social and physical skills that will encourage them to take the risks necessary to increase their opportunities for success. ■To provide staff training that will increase understanding of the children who have learning disabilities, demonstrate how best to work with these children and encourage and foster personal and professional development. ■To work cooperatively with the families of campers and other professionals who may be involved. ■To be an advocate for people with learning disabilities. Camp Kirk is located in Kirkfield, Ontario, on 110 acres of land owned and maintained by The Lion’s Clubs Camp Kirk Foundation of District A-16. Camp Kirk’s priority is to provide a warm and nurturing envrionment for children with additional needs. Dates: There are four different sessions each summer: two 10 day sessions and two 2 week sessions. Info: Over the 5 weeks, we provided 230 Camp slots from the 247 requested, for 101 Campers with a staff of 57 Camp Counsellors and Volunteers. This offered respite and peace of mind to 95 families. At Camp there were four distinct groups: Monkeys-our youngest age range, Dragons-our mid age range and Titans or the name of the week decided by the Campers for the Teens and older Campers looking for more challenging activities. In addition we had the Lightning Bolts with teens that required more assistance with life skills. One week we had so many Dragons that the Group divided into Red and Blue Dragons each with their own room! Info: Spring Action Trampoline and Circus school has been offering trampoline and circus lessons to people of all ages and abilities for over twenty years. In 2002 Spring Action expanded its programming to individuals with Special Needs! Edelweiss Private Academy is offering a summer program for children with Autism Spectrum Disorder and /or other exceptionalities. **Check out their special needs programs that are run all year round. Info: Making Waves builds on the institutional strengths and successes of existing swimming lesson organizations. We are able to be more effective in injury prevention by providing lessons specifically targeted and adapted to those children at highest risk of drowning in our society. We recruit our volunteers from the abundance of university-aged, qualified swimming instructors and work with our community partners to properly train, educate and prepare them for the rigours of working with special-needs children. We rent out pool space once a week, batch lessons together and assign one instructor to each child. By using innovative techniques to dramatically cut our operating expenses, as well as by actively fundraising, we are able to offer private swimming instruction at a rate affordable even by those living under the poverty line. Info:Offering a specialized form of horseback-riding to people with physical and/or developmental disabilities in Lanark County since 1986. Prices: The Therapeutic Riding Program does not receive on-going government support. Funds to run the program are raised through lesson fees (using a sliding scale), support from the community, grants and various fundraising events. The program is currently receiving some financial support from the Ontario Trillium Foundation and the Ministry of Tourism and Recreation. We also received support from the Perth Community Foundation and the Ontario Therapeutic Riding Association. Info: We provide a unique farm experience and riding therapy specialized for children and adults with autism, learning disabilities and self esteem issues. Our goal is to help children through contact with animals and more specifically with the horse. We provide a safe, unstructured physical environment where the child can explore, and discover. Info: Friends in Sportfishing is a volunteer run charitable organization dedicated to providing free fishing experiences for any group of people with special needs in our community. We operate a fleet of 5 twenty eight foot pontoon boats that have been modified to make them accessible. We provide the boats, crews and all the fishing equipment necessary and we operate out of a variety of venues in Eastern Ontario. Info: The Destiny’s Way summer camp program which runs from July 6 to August 30, 2014, promotes creativity, self esteem, social skills, sensory stimulation, and allows for some good old fashioned fun. The camp week starts on a Sunday and end on the following Sunday for a total of seven days. *All activities are adaptable and are based on functionality and level of comfort. Alternatives are always provided to ensure the Destiny’s Way experience is a positive one. 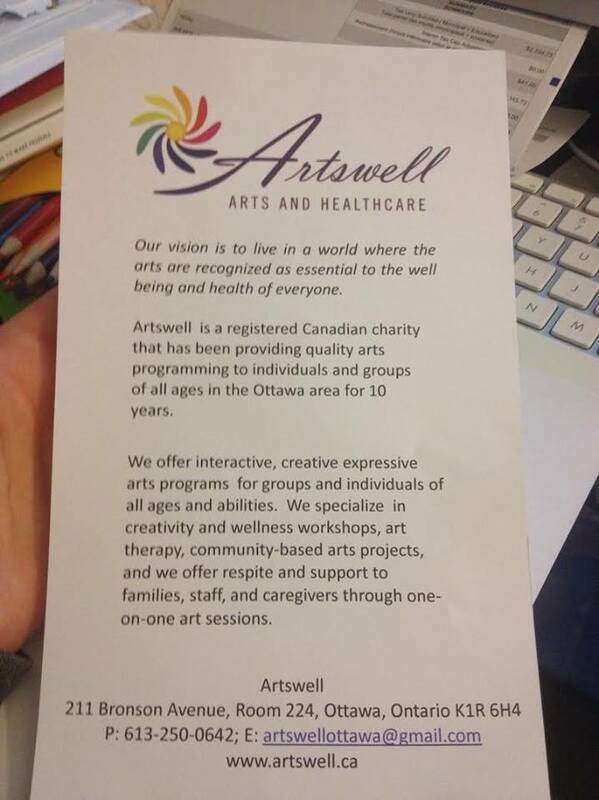 Info: AngelnButterflies is providing Conductive Education services in Ontario Canada, Ottawa metropolitan area. Angel n Butterflies has been created for helping families with special needs people. To achieve our goal, we are using a Hungarian method called Conductive Education which is more a lifestyle than just a therapy. Book your appointment by email @ angelnbutterflies@gmail.com or phone : 613-438-0865 / 613-804-6250. Boosting the active learning in the Client’s home environment. Info: Is a program designed to meet the challenges of those with ASD, including individuals with Sensory Integration Disorder, Down Syndrome, Cerebral Palsy and other significant developmental and global delays. Experiments are designed to meet the needs of children and keep them engaged during the experiments. We will provide plenty of opportunities to include social skills, language based activities and cooperative games. Each participant receives a package ahead of time to review and anticipate the fun we will have with science experiments and other cool activities! Themes for this year will be science and Star Wars, designed to meet the needs of participants and keep them engaged during the experiments. We will provide plenty of opportunities to include social skills, language based activities and cooperative games. Each participant receives a package ahead of time to review and anticipate the fun we will have with science experiments, Star Wars adventures and other cool activities! The programs will be held at the Maki House @ 19 Leeming Drive, Ottawa (Moodie Dr./Carling Ave.) We added an extra hour per day and will have early drop off 8:30 and late pick up 2:30for a $5.00 fee per day. Ages: 7 and up (no upper limit). Info: Making Kids Happy Since 1967! A residential overnight camp for children and young adults with various exceptionalities ranging from ADD, ADHD, LD, Autism, Aspergers, Tourette Syndrome, Down Syndrome and other special needs. We offer a 1-6 week program, optional academics, 50 plus activities, out trips, theme days and so much more. Professional staff keep a 2:1 camper to staff ratio with a focus on fun, social and life skills. Info: For children 7 and up and adults with ASD’s, Down Syndrome and CP. Location: On Lac Bitobi near Gracefield, Que. Camp Misquah Cottage Experience: For independent adults with developmental disabilities who wish to experience a relaxing cottage holiday, participating in activities such as cards, board games, swimming and day trips if they wish. 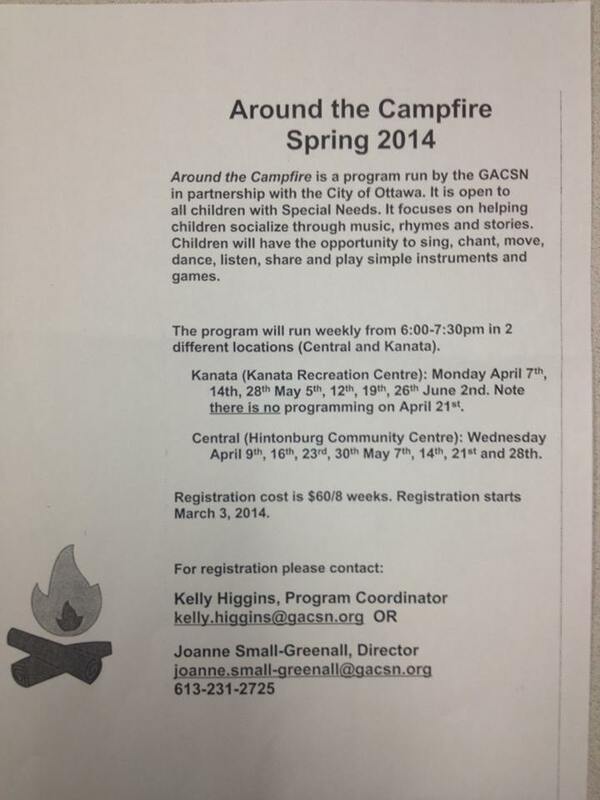 Info: Operated by the Boys and Girls Club of Ottawa-Carleton. Sleepover camp with integration component for 8 to 15 year olds. (flexible upper age limit). Leader in Training program for 14 and 15 year olds. Financial Assistance is available. Camp Towhee: Children and adolescents with learning disabilities and related psycho-social problems including Asperger’s. Must have a diagnosis. Deadline for applications for summer camp is mid-Dec.
Info: Residential special needs camp that includes children (age 7-13.) with learning disabilities, AD(H)D, Tourette Syndrome and Autism Spectrum Disorders. The Kinark Outdoor Center (KOC) operates year-round to provide a rich variety of outdoor education programs and autism support programs tailored to a wide range of needs and interests. The Kinark Outdoor Center offers a variety of adapted traditional camp experiences and enhanced respite opportunities for children, teens, and young adults on the autism spectrum. 5-day camp opportunities for kids with ASD are customized to meet the campers’ needs; Family Respite weekends and Family Camp experiences are well supported to meet the needs of all visitors. This is a 5-day residential summer camp experience for children with Autism. The focus of the week is on social and therapeutic recreation supported by a high ratio of staff to campers. Groups of five campers experience the social skills inherent in a camp setting with four staff to support individual needs. This is a direct funded MCYS Respite program in response to parents and service providers indicating that there exist social skill developmental service gaps for adolescents in rural areas within the Central East Region. It is a year-round program for 6 participants involving a weekend residential experience every second month and a 5 day summer camp experience. Youth (14-18 years old) who are diagnosed with Asperger’s and high-functioning autism, develop and practice social and life skills through this 5-day residential camp experience. In a group with five participants and three staff, programming includes outdoor activities, cooking, fitness, leadership, and communication skills. This is a social-recreation weekend for six to eight ASD families who are often on the waiting list to receive service. The program provides a one-to-one worker for the identified child, as well as sibling, and parent programs. Opportunities for respite, networking, and social skill development are offered throughout the weekend. The program was developed in direct response to families who greatly appreciated the AFR Weekends, but are now looking for an affordable option for families who did not require one-to-one support. It is a four day summer recreation program for a group of 15 ASD families. Info: Discovered Treasures Day Camps which serves over 200 children runs for 6 weeks in the summer. Two of these camps are run simultaneously. Each camp session provides children a fun, safe, and therapeutic environment where their individuality and uniqueness is respected and nurtured. Each child will be provided opportunities for sports, Martial Arts, arts and crafts, cooperative activities, swimming, relaxation, and much more. Relaxation training is also offered to help children improve skills in related areas such as mental imagery, focus and shifting focus. All elements of the program are inclusive of the cost of registration and are made available to every child over the course of the summer. Our Developmental Day Program was created to serve children with higher complex needs such as non-verbal children with Autism, Acquired Brain Injury and Developmental Disabilities. This program focuses on identifying the individual child’s needs and strengths. In a highly structured, supportive and predictable environment, children will have opportunities to develop qualitative play skills and daily living skills by enhancing communication, socialization and decreasing challenging behaviours. This program operates at a 2:1 ratio, camper to staff. Our Social Skills Camp runs for 6 weeks. We provide specialized therapeutic programs to over 200 children. We take great pride in a staff to camper ratio of between 1:3 to 1:4 at all times. The campers are primarily special needs students having Aspergers Syndrome (a communication disorder), ADHD, Learning Disabilities, delayed cognitive functioning, or Down’s Syndrome. Camps may be run out of a more central location. Info: provides integrated camping experiences for children across Ontario with one-to-one support. In partnership with Eastern Ontario-area camps. Weekly Outings with a focus on developing independent living skills, social skills and making friends! Social Planning – planning parties, events, group activities, calling friends, emailing. DATES: Currently booking Weeks of July 7-11, 14-18, 21-25 & August 18-22 – Book Early! The cost of all events we attend are covered. Students are only required to bring money for lunches, bus and personal shopping. YMCA/YWCA Camps: Limited number of one-to-one support placements available in most camps. T.I.P.E.S. Summer Camp: Registration deadline is April 30th. Respite will be available for an additional fee; respite will be available for an additional fee and will be available until 5:00 p.m. after camp hours, Monday to Friday. Camp is offered half days or full days, either two days a week, three days a week or five days a week. Info: It will be run as a parent child camp, however, if a caregiver is unable to attend the camp with their child other arrangements can be made. Conductive Ed works to maximize the potential of each participant allowing them to be as independent as possible by targeting gross and fine motor skills, as well as speech and cognitively.